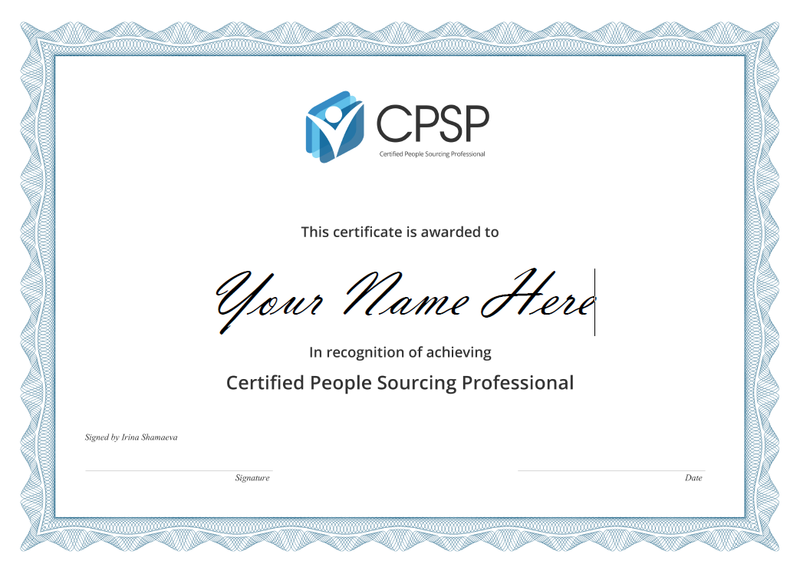 The Certified People Sourcing Professional credential (CPSP) is the international industry standard for demonstrating proficiency in Sourcing. Earn your certification by completing our 60 question Exam, and join the growing ranks of Certified Sourcers. We offer the Exam during several Exam Weeks each year. Once your chosen Exam Week begins, you may start the Exam at any time. From the time you start, you will have up to six hours to complete all 60 questions. On average, the Exam takes three to four hours). If you do not pass the Exam on your first try, you will be offered one free retest during the same Exam Week. Our sample questions will give you a preview of what to expect. The CPSP credential remains valid for two years from the date printed on your certificate. Renewing your certification requires retaking the Exam. When you're ready to become certified or renew your current certification, complete the form below, or contact us about scheduling Exams for your Recruiting Team. The Certification Exam costs $199 per seat (but is free for Training Library subscribers.) Upon completing the form below, non-subscribers will be redirected to a payment page. You will receive confirmation of your registration within one business day. You will receive additional instructions about accessing the Exam about 24 hours before the start of your chosen Exam Week. I am registering on behalf of someone else. If you are registering on behalf of someone else, please include their name, email, and phone below, so that we can provide the Exam instructions to the correct person.